I did not get any sleep the night before. Tried to close my eyes but nada. Because I couldn’t sleep, I did my ITB strengthening exercise and felt tired afterwards. I was compelled to take the taxi which cost me P200 😦 (OK, so this one is more of an emotional blow). I registered for 3K and took it easy to conserve energy for the next day. Coach Lit forbade us to run on back-to-back days so I did a power walk for cross-training. 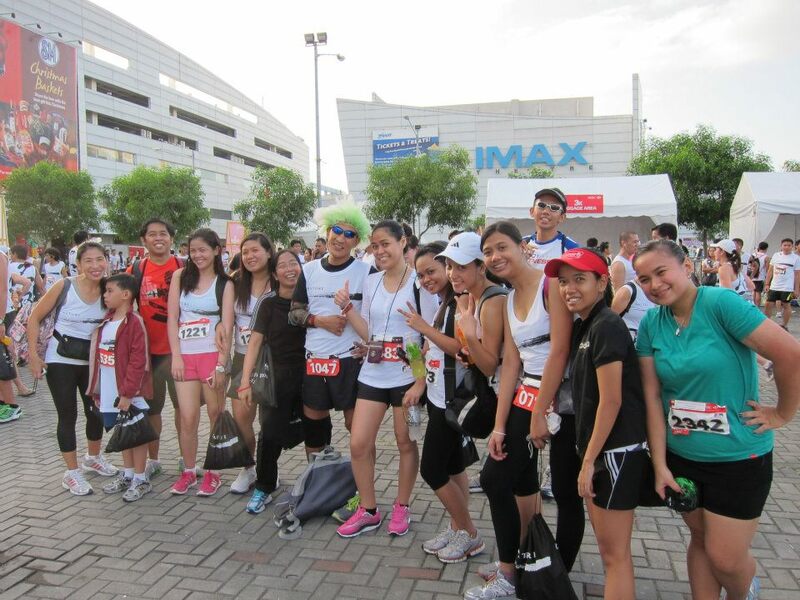 I went one loop around the MOA complex along with a curious mix of participants, sprinting only near the finish line. I managed to get an average pace of 8:26 which is pretty darn decent for a walk. However, despite my precautions, I felt my whole body aching from the cumulative toll. Well, lessons learned the hard way. I slept the whole day to make it up to my battered body. Special shout out to the little girl in pink who won the 100-meter dash for kids 6yrs old and below. She made the boys eat dust and we were all cheering! Woot! After lots of sleep, stretching, and self-massage with Efficascent Oil, I was ready to take on the challenge of doing two consecutive runs at different venues. I went out the house at 5am and because there were no jeeps yet, I was forced to walk from Project 4 all the way to Greenhills, my first time to do so. It’s interesting. When you’re a runner, your perspective on distance truly changes. I claimed my free race kit then and there. As I was trying the singlet on the sidelines, the Fitness First guy energetically led the participants in a warm-up routine. Gun start for the various categories soon followed in 5min intervals. Just before 6am, us 5K runners were off. I ran at a steady though slightly faster pace than I wanted. 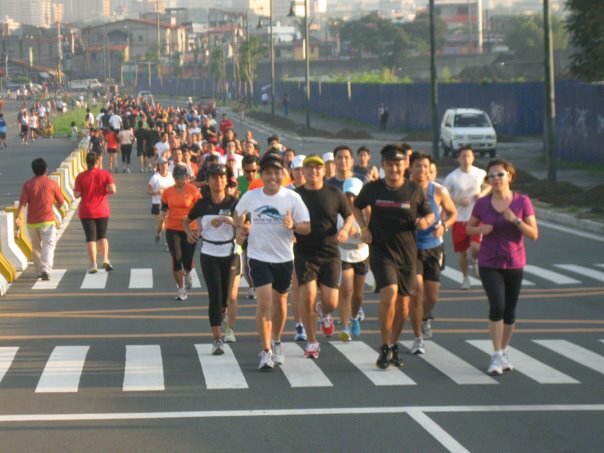 The course was mostly flat along the length of Ortigas Avenue (which would really benefit from street sweepers) and uphill towards the back of the mall. There was a corner where one can either go straight ahead or turn right, and because I couldn’t understand the marshal, I opted to go straight (only for this route 😉 ). After I passed the U-turn, something felt odd. I was among the very few who were on the way back to the finish line, in the company of veteran runners. Uh-oh. When I got back to that corner, I talked to the marshal for clarification. I was right, I missed one loop, so I resolved to complete it before finishing the race. Getting a winner’s medal by mistake would have been horrible so I’m glad I was able to rectify the situation immediately. My GPS registered 5.79K in 0:40:21 for an average pace of 6:58, dangerously faster than my projected 7:50 LSD pace for the week. I hope my knees are okay. 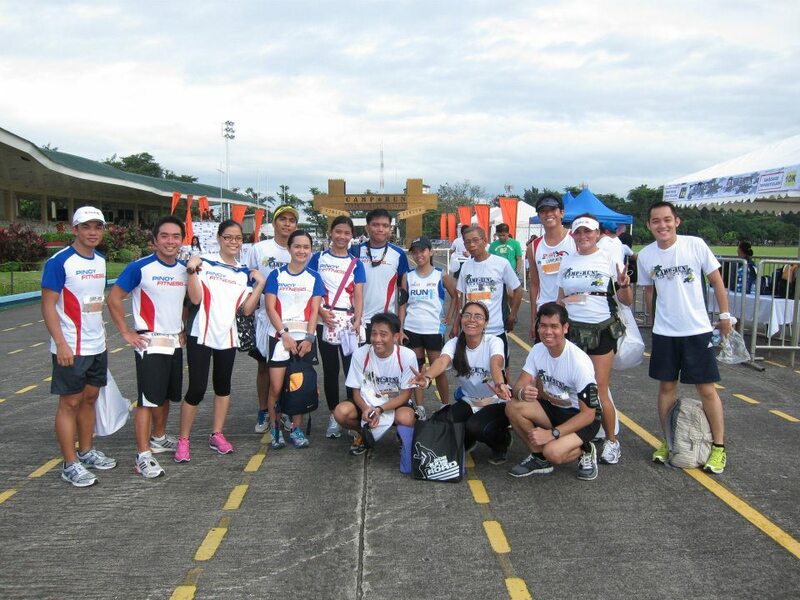 Kudos to the organizers and (kulit) race marshals for a great event! I’m glad I ran this because I discovered a new and challenging route near my house for future training. I wish I could’ve stayed a while but there was absolutely no time to rest. I had to get back to EDSA and then to Camp Aguinaldo, quickly! I entered the gates just in time to hear the countdown. “8… 7… 6…” Since the 5K gun start was scheduled at 7:15am, I thought these were the 10K runners. I leisurely watched them pass me by hoping to see my running buddies among the crowd, but I didn’t. So I proceeded to the starting line to look for my dad and to my surprise, no one was there. Then I realized that what I just saw were the 5K runners released early. I had to catch up with the pack and find my dad. Zoom! It’s a good thing that I’m very familiar with the route here so I didn’t have any trouble sticking to it or pacing myself. My most pressing problem was hydration. I didn’t bring any water thinking I’d depend on what was being offered during the races, which worked fine with Greenfinity but I was technically a bandit here. Anyway, I reasoned that it’s a matter of life and death so I boldly got water from the drinking stations while apologizing inwardly (pasensya na po). Papa with his finisher's military dog tag - 60+ and running! In front of the Grandstand. On regular days, this is where I do my speed work. Aha, this angle makes me look tall. I’m not really the type who aspires for a magazine feature but I took a picture of myself to analyze my running form and the resulting image seemed like a good fit for a mock cover. Blank spaces aplenty. I used to be oblivious to my physical condition, preferring to engage in intellectual pursuits. In short, I was a nerd. Running has made me aware of and appreciate my body. So what if it has flaws? It’s a fantastic machine! It’s also the only one I’ll ever have, so I’m learning to be at peace with it and trying to take care of it as best I can. I’d like to test its limits and see all the amazing things it can do. The 75-25 Rule. 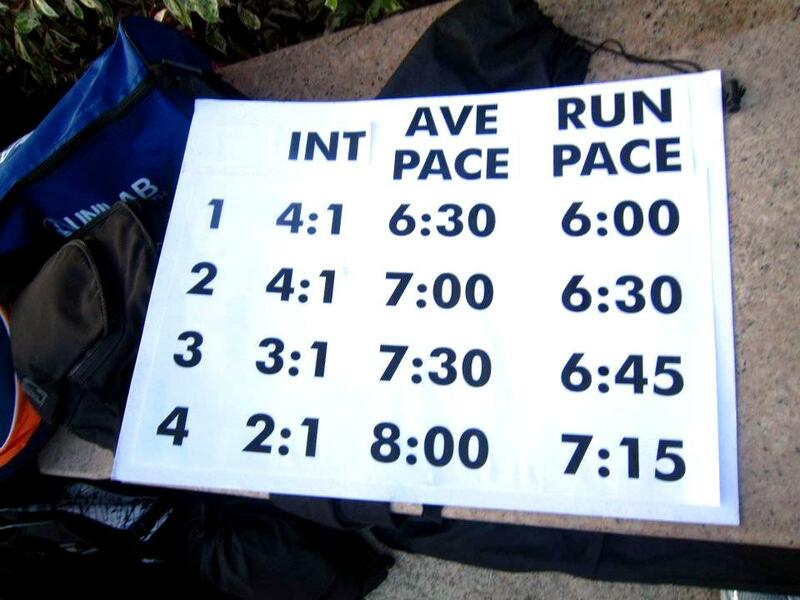 Run the first 75% of the intended time/distance at a conservative pace. If you’re still feeling strong after that, feel free to pick up the tempo for the last 25%. 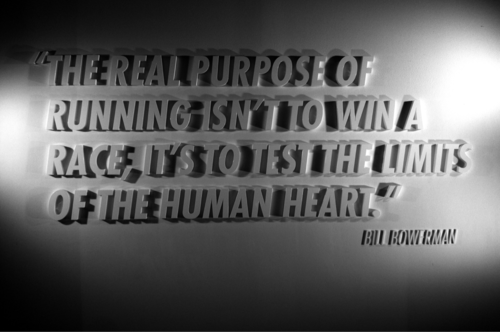 Run slower than marathon pace. If you have a projected time for finishing the 42K, compute for the corresponding pace and do the long runs at a pace that’s slower by a minute or so. Relax and enjoy. There should be no pressure to get a PR every week. The most important thing is to finish strong, injury-free, and still smiling. There will be a time for hard runs. Walk early, walk often. Rather than running all the way at the beginning and resorting to walk breaks in the latter half, the other way around is preferred. Walking early is equivalent to depositing energy for the crucial stages. Rest and recover. Don’t run the day before to rest and have fresh legs. Don’t run the day after to give your body enough time to recover. However, it’s possible to cross-train as long as you don’t tire out your legs (swimming, cycling, walking, etc). Apparently, he also showed some books for marathon beginners. I saw the covers later and recognized the authors: Hal Hidgon, Jeff Galloway, and John Bingham. Fortunately, I’m already familiar with their methods and philosophies. 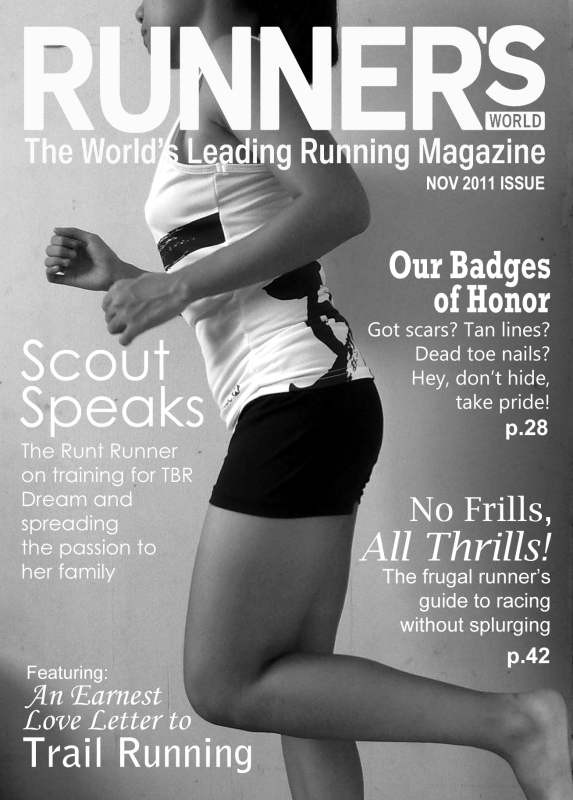 The curious can look up their articles on running which are posted all over the Internet or click on their names to go to their websites. Joyce and I joined Group 4 instead, led by Jaymie herself. 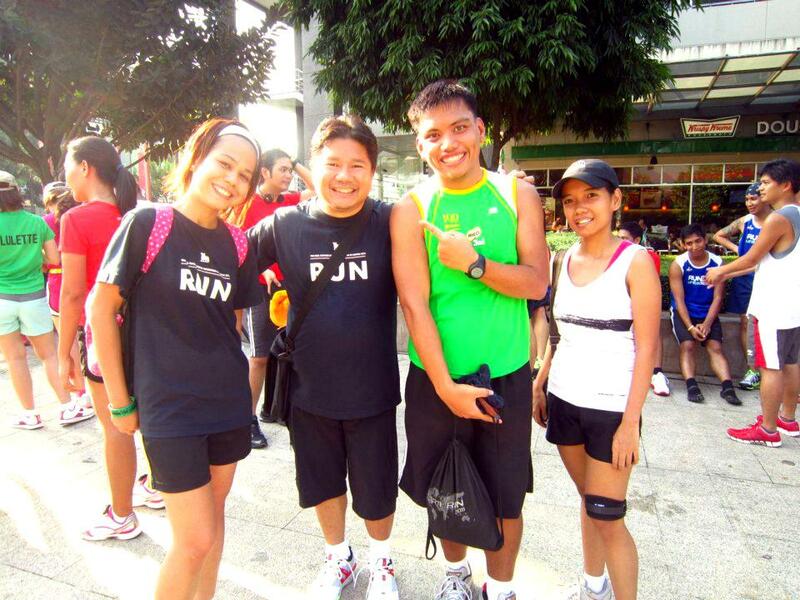 This was the “chika pace” or tortoise group consisting of uber-newbies, injured runners, and those taking it easy because they had a race the next day. We went for a very relaxed run while talking about so many things. 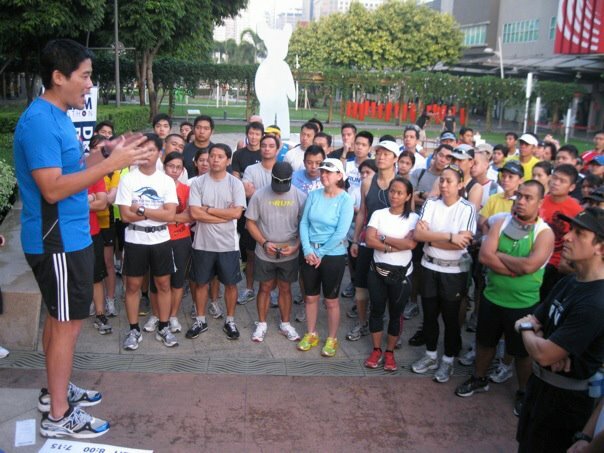 Before we knew it, we were back at Boni High Street and the training run was over. The GPS tracked approximately 7K in under an 1hr (our training plan called for a 55min run that weekend). My knees didn’t hurt at all even after tackling hills and it was a great relief. Patience paid off.